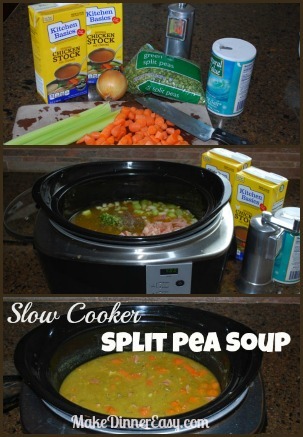 This version of split pea soup may be the easiest dinner you will ever make; it takes very little prep time. While this recipe calls for turkey ham, you certainly could use ham or a ham bone. I can find a 2 pound Jennie-O Brand mini ham in the meat department of my local grocery store. This will yield you about 6 cups of diced ham. 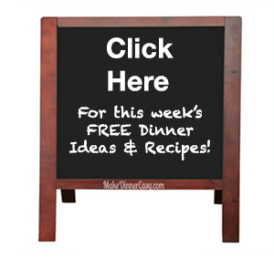 Refrigerate or freeze what you don't need for this recipe and use it for another meal. If you want to use regular ham, you can ask the deli department to cut you a thick slice, or ham steaks can often be found in the meat department as well. You can also go vegetarian and omit the ham completely! 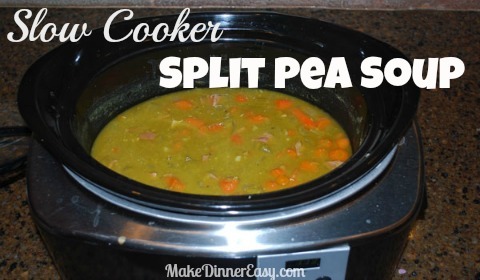 Rinse the split peas, drain well and place in a slow cooker. Add remaining ingredients. Cover and cook on high for 4-6 hours or on low for 9-10 hours. The soup is done when the individual peas can no longer be identified and the soup is a smooth consistency.